Find yourself someone who loves you as much as Fall Out Boy loves Chicago. Some bands talk about how much they don't like their hometown. How much they want to leave. How much they hate it (not looking at anyone specific, but hey there A Day To Remember). But that's absolutely not the case with Fall Out Boy. 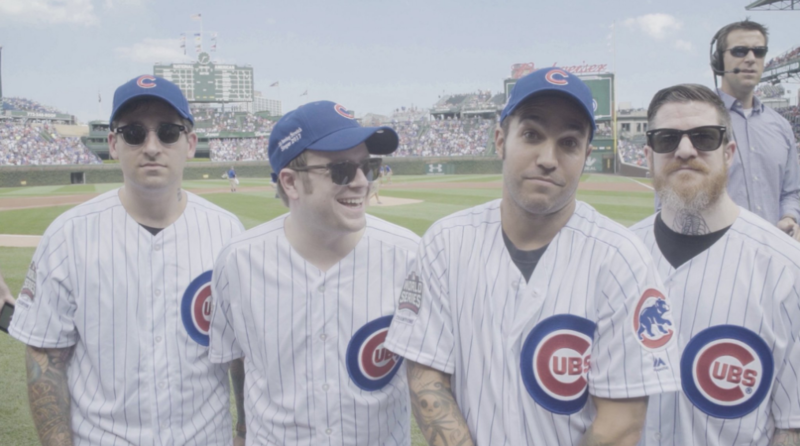 The only thing that Fall Out Boy likes more than making music is their hometown of Chicago, Illinois. Don't believe us? We went through their discography and pulled out all the references they make to their hometown. Let's do this. Go Cubs! This one's a bit heavy, but speaks to the band's love of their hometown (and maybe has just a twinge of regret for ever leaving it?). Especially the lyric "The glow of the cities below lead us back, to the places that we never should have left". Not a direct Chicago reference, but it makes reference to the lake- AKA Lake Michigan, one of the most well known Chicago landmarks. "I spent most of last night dragging this lake, for the corpses of all my past mistakes". In this one, Patrick Stump is leaving the small town of Glenview, Illinois for the big city lights of Chicago- illustrated with the lyric "I've dried my eyes, now it's "Rushmore", I'm deep with futures like Chicago". This one is kicked off straight away with a reference to Chicago, with the opening line "Landing on a runway in Chicago". As a side issue, this song is woefully underappreciated and deserves all of the love. This baby references a significant Chicago landmark- Lake Michigan. The lake on which the city is perched beside. We'd put money on palm trees not surviving a winter in Chicago, but regardless the lyric "Plant palm trees on Lake Michigan before it gets cold" is a direct reference to Chicago, and we acknowledge it. Let there be no questions as to the loyalty of Fall Out Boy to Chicago, when they're throwing around lyrics like "Chicago gets my soul, Chicago gets my soul, Chicago gets my soul, Chicago gets my, gets my, gets my soul". This baby is only the first of three tracks off the 'Lake Effect Kid' EP, but spoiler alert- they all mention Chicago so you have two more to look forward to below. Who could possibly know who Fall Out Boy are referring to with the lyric "New York eyes, Chicago thighs". But it doesn't matter, because it's provocative. And it references Chicago. "And the street lights light up to take me home I love you Chicago"- it's pretty on the nose. It's direct. It explains the band's love of Chicago. Another part of the 'Lake Effect Kid' EP, this acknowledges the band's heritage and celebrates their hometown. Also the video that's made up of old footage from their early years in Chicago? Emotional. This one's a bit on the nose as well- Chicago gets a mention in the name of the song and the lyrics. Fondly thinking of Chicago, and lamenting not being there, it's right there when Patrick sings "But there's a light on in Chicago, and I know I should be home". It's enough to make you homesick for Chicago, even if you don't live there. The whole song is one big love letter to Chicago. 'Lake Effect Kid' is a direct reference to a snowy weather pattern experienced by Chicago due to its proximity to the Great Lakes, known as a lake effect snow. Also the lyric "'Til Lake Shore Drive comes back into focus" directly references the arterial road that winds around the lakefront, right in Chicago. This song has Chicago running through it in every single way. Not technically a Fall Out Boy song, but worthy of a nod. It sums up Patrick's feelings about Chicago so beautifully and poetically that to ignore it would be a disservice.